J. Appl. Cryst. (1996). 29, 309-310. Bertram Eugene Warren was born in 1902 and died on June 27, 1991, one day short of his 89th birthday. He was one of the brilliant long-lived X-ray crystallographers, like Ewald, Laue, Bragg, Debye and Pauling. His research and teaching were characterized by exceptional clarity and devotion to two guiding principles: make as few assumptions as possible and reduce theory to a state where measurements can be made. He taught his course to students over a 40 year period and attracted many capable students to his laboratory. There were students from France, Germany, Norway, Australia, Finland and, of course, from the USA, as well as other countries. Warren was born in Waltham and, as one could tell from his Boston accent, he was a real New Englander. He studied at MIT over the periods 1919-1925 and 1927-1929. In 1926, he was at the Technische Hochschule Stuttgart studying under Glocker and Ewald. In 1927 W. L. Bragg was at MIT and Warren was assigned to assist him, and this interaction grew into a silicate structure paper. Subsequently, Bragg became his dissertation supervisor, with the topic being metasilicate structures. For the year 1929-1930, Warren was at Bragg's home institution (University of Manchester) working with Bragg and R. W. James. In 1930, Warren returned as Assistant Professor of Physics to MIT, where he spent the rest of his academic life. Warren continued his early interest in silicate structures for a brief period, but soon moved away from pure crystallography with some important exceptions. In 1933 he confirmed Zachariasen's hypothesis concerning the structure of glass and continued with this interest until 1942. In a classical Warren approach, he returned to the study of glasses with his last graduate student, R. L. Mozzi, in 1966 after experimental and other techniques had been greatly improved. In the period 1933-1936, A. L. Patterson was a guest in Warren's laboratory and was enamored of utilizing Fourier series in the determination of crystal structures. He was exposed to the method of Warren and Gingrich in applying Fourier integral analysis to liquids and powder patterns. It may be that it was Warren who provided Patterson with the final key to the |F|2 problem but Warren never claimed any credit. Warren's scientific generosity is also seen in his calling short-range order coefficients Cowley coefficients, while Cowley called them Warren coefficients. Warren's main efforts were not so much in expanding and improving methods of structure determination, although his contributions here were significant, but in developing a newer application of diffraction: the investigation of nonperiodic and nearly periodic structures through quantitative measurement of X-ray intensities. His greatest contributions to science lie in his creation of mathematical and experimental techniques for deriving information on the structure of matter from X-ray scattering not necessarily restricted to Bragg reflections. The glass studies were only the beginning of these. Warren himself has said, in this connection, `As with humans, it is the deviations from regularity that are more interesting'. During this period of the thirties there were structure determinations by Warren and coworkers of simple substances that had not previously been done because of various difficulties; these included rhombic sulfur, black phosphorus, crystalline bromine, uranium and carbon black. Again, Warren returned to the study of carbon black in 1954 and 1965 with the improved methods available. Warren had the idea that short-range order would be liquid-like and that it would produce a modulated intensity from which order parameters could be obtained by Fourier methods. In the 1950's, this was realized in a number of studies by Warren's students. Temperature diffuse scattering (TDS) also became of interest; these studies were important in solid-state physics since TDS results from thermal vibration. 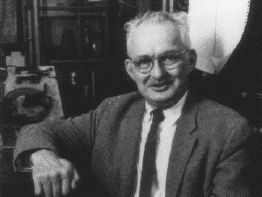 Also in the 1950's, Warren developed mathematical methods by which Fourier analyses of line profiles were able to give crystallite sizes, strain distributions and stacking-fault distributions. Thus the early interest in deviations from regularity had been continued by Warren into his most recent publications (1976, 1978), which were concerned with temperature effects on powder patterns and with powder-pattern intensity distributions from very small crystals. He did not remain static in his interests, one subject leading him into the next. Then, when techniques and corrections were improved, he was right back into the old game and making order of magnitude improvements. This always produced excitement around the laboratory and this was expecially obvious to the visitor. If Warren had not been a great teacher, it is doubtful that there would have been anything like the Warren School that did come about. Warren's teaching was on a par with his research; there were beautifully organized lectures, slides, models and examples from his own research. He began with the fundamentals and developed the solution to the problem within the problem with inexorable logic. There was never any fuzziness; only after the argument had been carried as far as possible were assumptions inserted. The working relations were then developed so that theory could be related to the results of experiments. When we worked on problems for Warren, we were experimental and theoretical physicists. Warren corrected every homework problem, every laboratory report, and the lengthy home examinations with meticulous care. His door was open six days a week. Students (and ex-students) could enter, ask questions, discuss results and learn physics. Often, graduate students who were working for other professors expressed envy of those who were in Warren's group. His help to those who were not members of his own dissertation group was remarkably generous and effective. If Warren had not had the character he had, the `Warren School of X-ray Diffraction' probably would not have been as effective. While he set a high standard for himself and demanded the same from his students, he established a rapport with them which was uncommon. He was enormously proud of his `boys'. Elna Warren, his wife, wrote that `to him, his graduate students were his life'. He often invited his students to go fishing with him at his camp in Maine and often had lobster cook-outs on Crane's Beach. A scene that sticks in my mind is that of Warren striding down a street leading a pack of ten or twelve of his students and ex-students to dinner while at the Pittsburgh Diffraction Conference in the fifties. In those days, we were a major part of the Conference. Warren was a man without false pride. He would, at conferences at remote locations, just as well fraternize with the gatekeeper as with the eminent scientists. It did not upset him that MIT put four retired physics professors, including himself, in one room. The fact that a physics secretary did not know who he was soon after he had retired did not bother him. In 1979, after having written his last paper, he stated that order-disorder in crystals was perhaps not the most important thing in the world. In 1984, when he was up at his camp in Maine, he measured the lake acidity daily and, in a blistering statement, condemned Reagan for inaction on acid rain. He applied his skill to the Indian method of starting fires by rubbing sticks together and achieved the remarkable result of producing fire in under one minute. He was a licensed Maine guide but, during one camping trip, a missed communication led to a newspaper headline of `MIT Prof Lost in Woods'. B. E. Warren was a stout friend and as loyal to his students as they were to him. He would write references and say to the person, `I lied as much as I could'. He was married to his wife Elna for 56 years. His life was an example to us and, even if we are not up to his standard, we are better human beings for having known him.